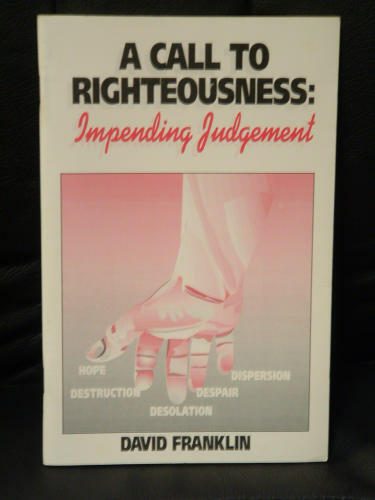 (3) If repentance is ignored, God will expose and execute judgment on an unfaithful nation. The book continues with a call for international righteousness (p. 10) and a critique of the debt-free myth proclaiming a time of economic shift (p. 11-12). Remember, this warning was written two decades before anyone in America had mentioned foreclosure, crises or global economic crises. But my favorite chapter still is the interpretation of Ezekiel’s vision of the departure of the Glory of God (p. 20-21). (1) Every time God renews His covenant with His people, He shows His presence. (2) We know that God is present in the covenant, because He shows His glory. It happened to Moses and his generation. And it also happened to Solomon several hundred years later. (3) When a generation looses the vision of the Glory of God, God begins renewing His covenant again with a new generation. (4) God is not satisfied with a people who know the signs and the blessings of the covenant. He rests not until He is revealed as the God of the covenant.